The highest compliments are repeat business, testimonials, and referrals from our clients. It means we got it right…. Find me on Houzz to learn more about what my clients have to say. I love to come home. Thank you for always listening to my desires for each and every project we planned from conception to completion. I love to come home. Be it a short errand or an extended getaway. Entering a space that has my personal style and your professional touch, is truly exceptional. From painting, tiling, wallpapering, furniture, carpet, staging and more. Putting it all together results in my absolute favorite place. And to feel totally confident in your work and organizational skills with contractors and subcontractors, I never hesitated to leave you in charge of our projects and home whenever we traveled. Completing our projects while we were away from home made remodels easier than I ever expected. Lori has helped save my husband and me more than once from a meltdown as we worked to make changes in our home. Her ability to listen and provide suggestions to meet both of our needs helped us move forward and the end result is something we're both happy with. I've known Lori and worked with her for many, many years, trust her implicitly and wouldn't hesitate to recommend her. 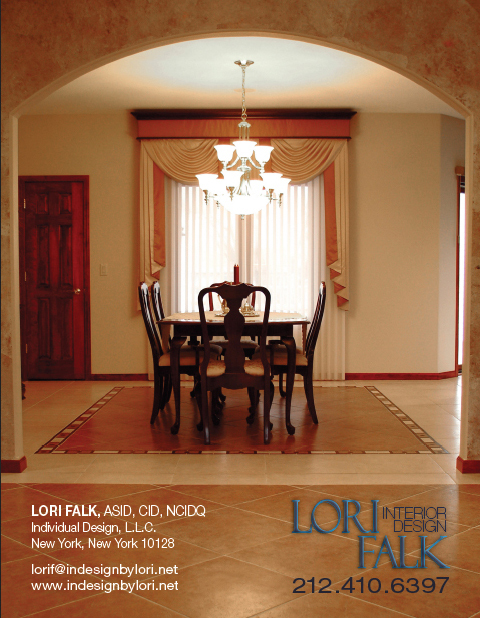 Lori Falk is a premier custom luxury designer. 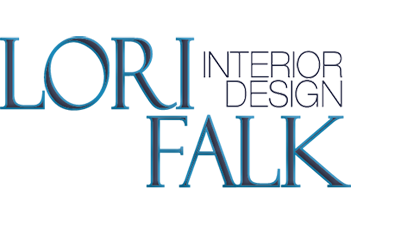 Lori advocates a polished design solution tailored to her client’s wants, needs and desires with a keen passion for excellence. Lori brings a positive spirit believing you should love what you do with gratitude. Lori has great insight and creativity and an in depth knowledge in her field. Lori also brings honesty and integrity along with her expertise. I have seen Lori’s work first hand and it is easy to say she does outstanding work. What is even more impressive is that she is an outstanding individual; in possession of a very pleasant personality, with the utmost professional approach. I have also known Lori through community involvement and have seen her ability of leadership over the many years; she is very responsible and accountable with her projects. Remodeling during a slow housing market gives you better value for your dollar. Here’s why now is a great opportunity to remodel or build, despite the economy. As we scramble to find investments that work in this economy, many are finding this to be the time to invest in your home. Remodeling, especially kitchens and baths, have very high returns on investment. Not only do you get to enjoy your newly designed space and all its benefits, by updating and upgrading your property you also increase its value and your net worth. When business is hot, finding professional and qualified businesses to work with is more difficult. There also tend to be longer timelines and increased pricing according to workload as a result. Because in today’s economy, however, people are being cautious, remodeling and building professionals need more work. Businesses are also hungry to keep their people working so they price projects more competitively. With people concentrating on fewer projects, they can devote more time to you, meaning projects move more quickly and efficiently. With greater availability of professionals to choose from, there is usually a smoother process with less downtime and timely completions. When given the proper amount of time and sequence of scheduling, the professionals can deliver higher quality with less possibility of damage to work already completed. I have experienced more problems or lack of quality because people are working within too short a timeline or are trying to work on several projects simultaneously. This is especially so for artisans and craftsman because they need to get to the next project. Today’s lower demand means more time and attention for your project. Many manufacturers have held prices low, but as soon as the economy picks up prices will rise. With pricing being held the last few years, many manufacturers have absorbed cost increases to keep products moving and inventory low. Lower pricing means a higher return on your investment. © 2017 Lori Falk. All Rights Reserved.